Item Number: 310-8-102 16192 Actual Weight: 0.7 lb. Strong and durable medium-weight utensils are made from vegetable starches. Made with 70% renewable materials. 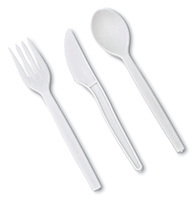 Heat stable to 200 degrees F, they are a great alternative to standard plastic utensils.